Switzerland might not be the biggest country yet still Swiss tourism can hardly be called minuscule. Majestic Alps dominating the best locations to visit alongside Switzerland’s picturesque countryside, old castles, magnificent turquoise lakes and stunning mountain peaks in all directions. Those wishing to experience this Swiss gem as fully as possible will have no problem of finding amazing places to visit and will be absolutely safe travelling around this low-crime rate country. So, let’s start our top places to visit while in Switzerland to experience the best of local tourism. Located in the center of Swiss Riviera on the banks of picturesque Lake Geneva this ancient water fortress used to serve the wealthiest counts of Savoy. Go for a walk by the lakeside or through the castle’s ancient halls with all of its treasures been preserved in the original shape. Chateau de Chillon comprises 25 buildings and three lovely courtyards and can be accessed either by boat, bus or by foot from the nearby town of Montreux. The country’s one and only national park is too spectacular to be overlooked. It features more than 150 square kilometers of snow-encrusted glaciers, spacious pastures, colorful waterfalls and dreamlike woodlands, making it one of the best places to visit in Swiss Alps. With 21 hiking routes crawling through the park, visitors are given a chance to glimpse Swiss magnificent flora and fauna. Travel to Lugano and see Switzerland in a completely different light. Due to Italy border in the south, the Italian influence can be best felt exactly in the Ticino region, considering the local language features, romantic villas in the Florentine style and rich cuisine. Lugano is also flush with all kinds of museums and contains some heritage sites like the neoclassical palazzos. A great place for dating vacations too! The Matterhorn in Zermatt proudly stands at 4,478 meters high constantly drawing many mountaineers from all around the world eager to conquer its summit. Hop in one of the cable cars zipping through the mountain stations, taking skiers and snowboarders to surrounding mountain tops in winter and hikers in the summertime. Still, we claim the winter is the best time to visit Swiss alps in order to experience more activities they can provide e.g. skiing, dog sledding and ice skating. The medieval town of Bern is among the best Swiss cities to visit. Hear the history singing in every corner of this charming city, especially in the Old Town. Archaic towers loom over the town’s sandstone facades, while its arcades are full of various boutiques, cafes and cabarets hidden within antique cellars. 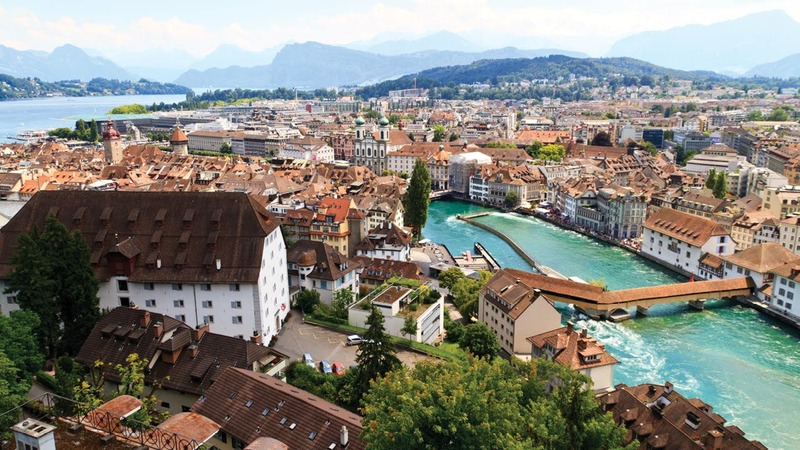 Bern is one of the most well-preserved Swiss cities to visit. The Rhine Falls is a truly bewitching natural wonder! Just imagine the mighty falls roaring from a breadth of more than 150 meters. Tourists can watch this spectacular view from several observation platforms while those daring enough can rent canoes and set sail to the surrounding, comfortably nestled on the banks of the lake.